As if we needed another sign that everything that is old is new again (see also, the return of 90s fashion, sexual harrassment, the gender pay gap), learning the ‘secret’ meanings of flowers is apparently in vogue. Yes, just like our Victorian forebears (and generations before them), we are all supposed to be fascinated by the symbolism of floral tributes. This could be for real, or it could be a spurious story cooked up to promote Valentine’s Day flower sales. I’m not convinced either way. That said, I do have to share a floral fact I’ve recently learned: fuchsia flowers and berries are edible. True story. I’ve long admired fuschias – there was a large, lovely fuschia overhanging the front door at the house I grew up in, and the house I live in now has a dainty miniature bush at the front gate. But it wasn’t until I read this post about foraging by the always-excellent Jane Wrigglesworth that I realised they were edible. While Jane suggests dipping them in tempura batter, I prefer dipping them in something far more refreshing. You can make this with any kind of edible flower, but it’s hard to go past the elegance of a fuchsia. Tiny rosebuds would also be sweet. 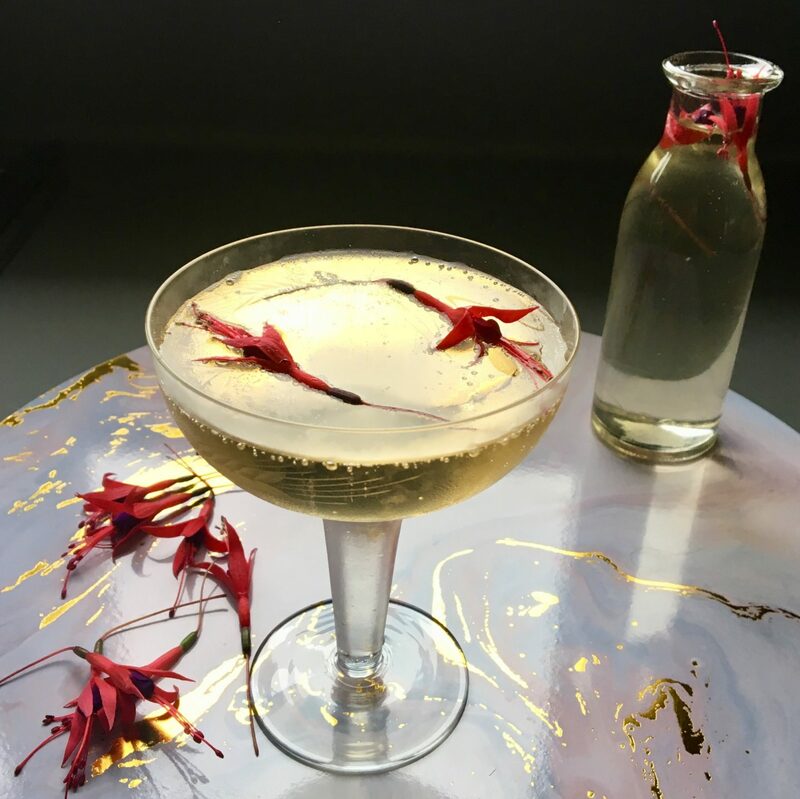 The base syrup is useful to have in the fridge and can be used in any kind of drink – use prosecco or sparkling wine, or soda water. Put the sugar and water in a small pot set over medium heat. Stir until the sugar has dissolved, then let bubble away for a couple of minutes until thick and syrupy. Remove from the heat and let cool completely. Transfer to a glass jar and stir in the rosewater (add more if you like, but it’s best to start with a light hand). Store in the fridge until ready to use. 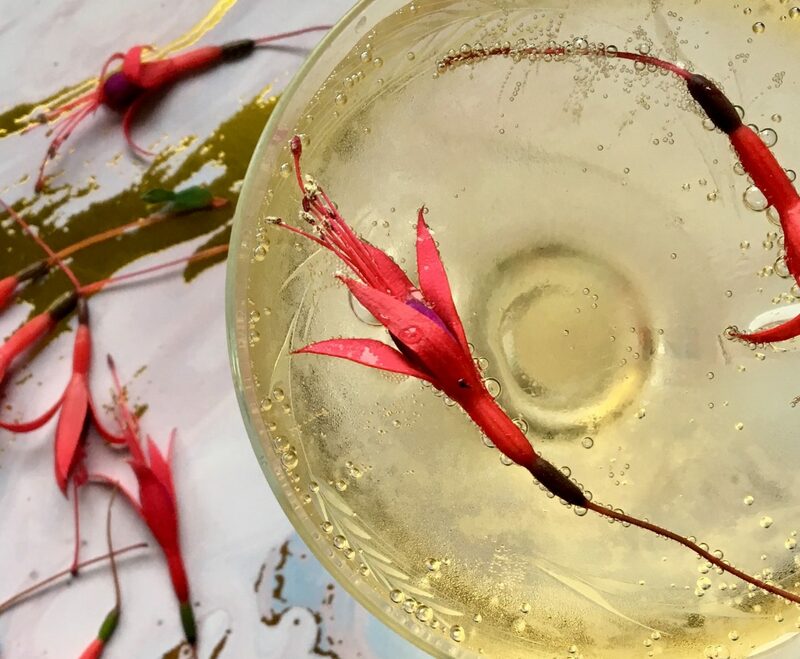 To make a proper fairy cocktail, put three tiny fuchsia flowers in a champagne glass. Add a tablespoon of syrup and one to two tablespoons gin/vodka. Stir well, then top up with very chilled prosecco, sparkling wine or soda water. Stir gently and serve immediately. Thinking back to when I was really into edible flowers, it was the only time I ever had a fuchsia bush; but I didn’t know fuchsias were edible! Now I’ll be on the lookout in the gardens of organic gardening friends.